What’s the best way to transfer texts from old iPhone to new iPhone XS? How to transfer texts from old iPhone to new iPhone XS easily? How to move texts from old iPhone to the new one without hassle? How to migrate text messages between two different iOS devices efficiently? Hello! I just bought a new iPhone XS as an upgrade from my old iPhone X. My question is how to transfer those texts from old iPhone to the new phone. I can’t figure the way to do it. Anybody can help? Thanks in advance! The smartest, most powerful chip in a smartphone. And a breakthrough dual-camera system with depth control. iPhone XS would be everything you love about iPhone. After getting a new phone, you may like to transfer text messages with important or sensitive information from the old iPhone to new iPhone XS. Well, in this article we are going to introduce a powerful tool to solve the problem. This tool is iFonebox, it will help you easily move texts from old iPhone to the new one in a few clicks. It's mainly used to help you transfer notes, contacts and text messages through different iOS devices. 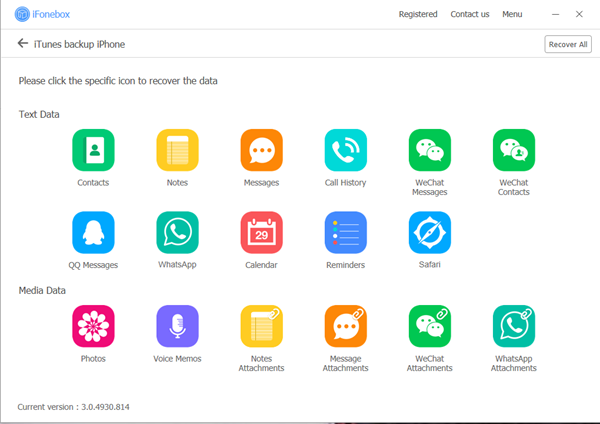 Furthermore, with its help, you can transfer almost all file types on your iPhone/iPad/iPod touch to computer, such as photos, videos, voice memos, calendar events, reminders, inter browsing history, phone numbers, WeChat data, WhatsApp data and many more. If you have accidentally deleted your contacts or have lost all contacts on iPhone due to a glitch, you can also take the assistance of iFonebox to get them back. It’s capable of scanning your device deeply and showing you all the recoverable data as long as they’re not wiped by new data. What an amazing program! It has two available versions: Windows version and Mac version, please make sure to download and install the correct version for your computer. 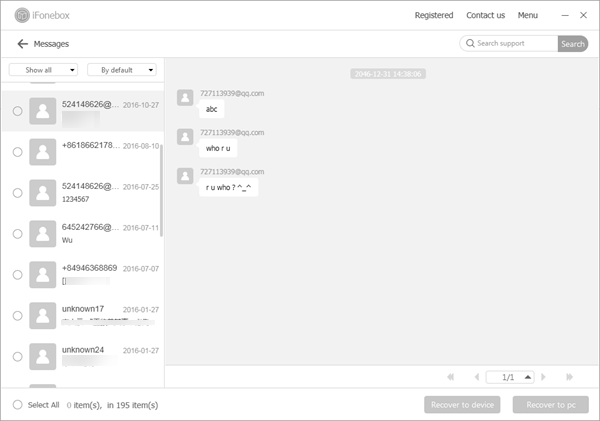 Then you can follow the next steps to migrate text messages between two different iOS devices efficiently. 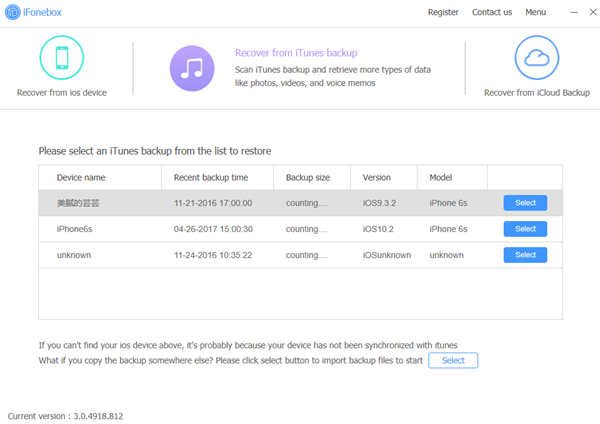 Connect your iPhone XS to computer and click Recover from iTunes Backup File, you’ll see all backups you have listed in the interface, choose the right backup, then click "Select" button to begin. After the scan completes, a list of texts will show up on your program interface. Just choose the items you want and click the “Recover to device”.